As I write this comment events in Venezuela are still developing this January 23. The date marks the day Venezuelan dictator Marcos Perez Jimenez was overthrown 61 years ago. It is an important date for all Venezuelans. It is understandable that the government and its supporters want to celebrate it with their banner of “Marcha por la Paz y la Soberania” (March for Peace and Sovereignty). But so does the opposition in Venezuela although their goal is quite different. They seek a coup d’état for a regime change publicly called for today by the vice-president of the US government, Mike Pence, on his own video tweet. We have seen many different ways to achieve regime change when the US puts its mind to it, but this one today maybe the first, at least in my recollection (pending more research). US president Donald Trump and OAS Secretary General, Luis Almagro, quickly, evidently already prepared, announced their recognition of their choice of president for Venezuela; not the one that was legitimately and democratically elected. It is to be expected that the Canadian government will follow suit. I am still trying to overcome my outrage as I write. Outrage at the stupidity of some humans when they have some power and they feel entitled to abuse it. That goes to Trump and Almagro. They have a total disregard for the international laws they are called to abide to, for the sovereignty of nations and for the will of 6.3 million Venezuelans who gave a majority vote to Maduro. Outrage at the level of blindness of some Venezuelans who do not recognize when they are being manipulated and become cheap political pawns in a dangerous game. Ambition? Greed? Inflated ego? Ignorance? Certainly it is not modesty and sanity. As events are still developing we have more questions than answers. 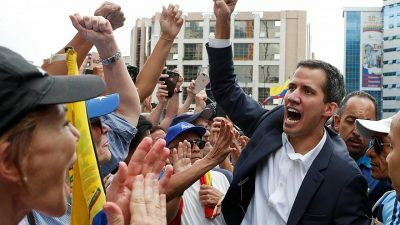 We know the reaction of the US government and Luis Almagro, but what will the legitimate government of Venezuela do? If this is an overt case of treason and real usurpation of power by the opposition, how will the constitution be applied? We remember how the Venezuelan people came to the rescue of then president Hugo Chavez in the attempted coup of 2002, how will the people in Venezuela react now? Under this unusual scenario in Venezuela, what is the role of the United Nations? How will other governments react? We will watch developments in the next few days. In the meantime the early conclusion I can draw is that today we have Trump, Almagro and Guaidó as the Troika of insanity!